'63 Boycott aims to re-unite participants of Chicago's biggest ever civil rights march. On April 1st, 2013, Chicago's Kartemquin Films (Hoop Dreams) will launch www.63boycott.com as part of '63 Boycott, a cross-platform, web driven project designed to connect with participants in the historic 1963 Chicago Public School Boycott and engage the public in the importance of this history when considering the issues the city's public education system faces today. The website will help find the subjects for a documentary film, and evolve into a platform for those who participated in the boycott 50 years ago and those struggling for equal education today. The project is directed by Gordon Quinn (A Good Man, Prisoner of Her Past) and produced by Quinn and Zak Piper (The Interrupters). The filmmakers hope to use the website to locate people who participated in the massive civil rights demonstration on October 22nd, 1963, known as "Freedom Day", where more than 200,000 Chicagoans, mostly Chicago Public Schools students, marched to protest the segregationist policies of CPS Superintendent Benjamin Willis, who placed aluminum mobile school units (trailers) on playgrounds and parking lots as a permanent solution to overcrowding in black schools. This project marks the first time in Kartemquin’s 47-year history where the subjects of a film will be located using an interactive website. Visitors to www.63boycott.com will be able to browse over 500 photos pulled from Kartemquin’s never-before-released footage of the Chicago School Boycott shot by Gordon Quinn himself when he was a student at the University of Chicago. The site allows users to identify and tag themselves and others in the photos, share their stories with each other and the filmmakers, and upload their own images. The filmmakers will select individual stories for inclusion in the film, '63 Boycott, to be completed in time for the 50th anniversary of the boycott this Fall. The film will combine hours of unseen footage of the boycott with then-and-now interviews of participants and organizers. Kartemquin Films co-founders Gordon Quinn and Gerry Temaner were students at the University of Chicago in October 1963, and organized a film crew to capture the demonstration. The result is an astounding time capsule of this, until recently, largely forgotten history. A preview of the footage is currently on display as part of the Chicago History Museum’s “Facing Freedom Exhibit,” edited by Kartemquin Films’ Post-Production Manager, Matt Lauterbach. 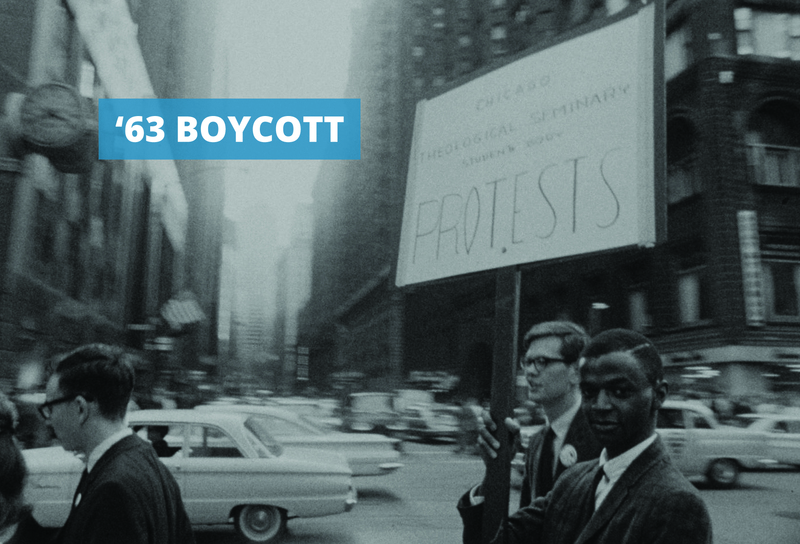 Kartemquin Films invites participants across the country to share their stories of the Boycott and how it shaped their lives at www.63boycott.com, via email at 63boycott@kartemquin.com, or call 773-413-9263. The project has gotten a tremendous response from boycotters even before the launch of the website. The filmmakers have spoken with former CPS teachers and students involved in the boycott, in addition to having already filmed two interviews with the organizers of the event itself. '63 Boycott arrives at a time when Chicago public schools are more segregated than ever. The film and website will provide a modern perspective on the impact and legacy of 1963 Chicago School Boycott. The website was designed and built by Arlen Parsa with assistance and support from filmmaker and Kartemquin associate, John Fecile.